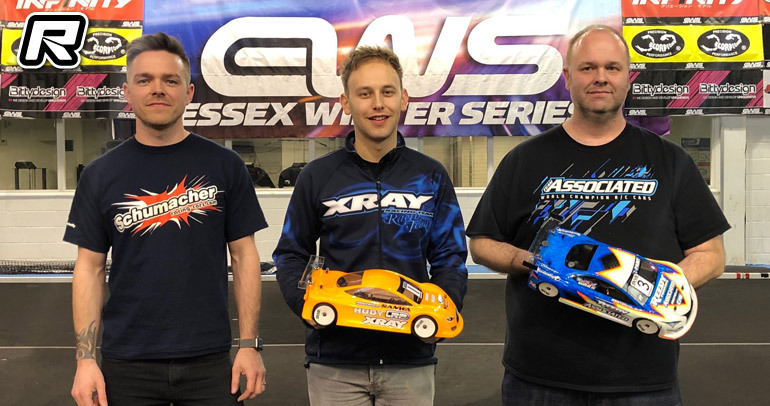 The 2018/19 Essex Winter Series presented by Infinity concluded last weekend. With only one of the championship titles decided, everything was still to play for and the series saw a complete sell out for its final event. In the Scorpion Modified class, Xray’s Elliott Harper had already sealed the overall title at the previous event. 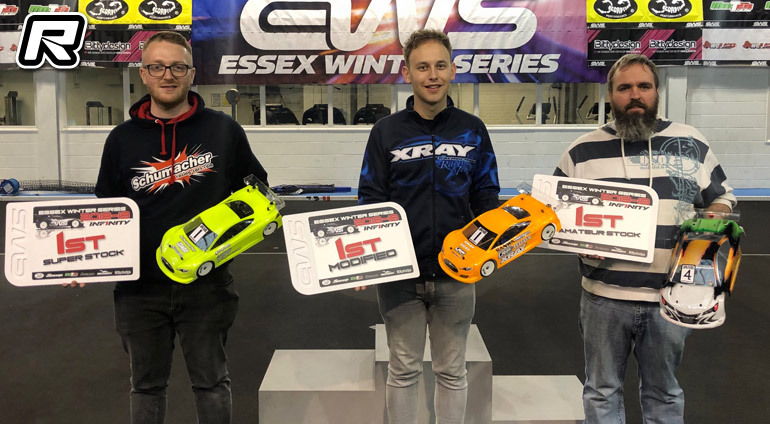 But he wasn’t resting on his laurels as he opened up qualifying with the fastest time, three seconds up on Matthew White’s Associated, with Olly Jefferies taking third for Schumacher, and Stefan Chodzynski (private Xray) and Alan Bickerstaff (Associated) rounding out the top five. 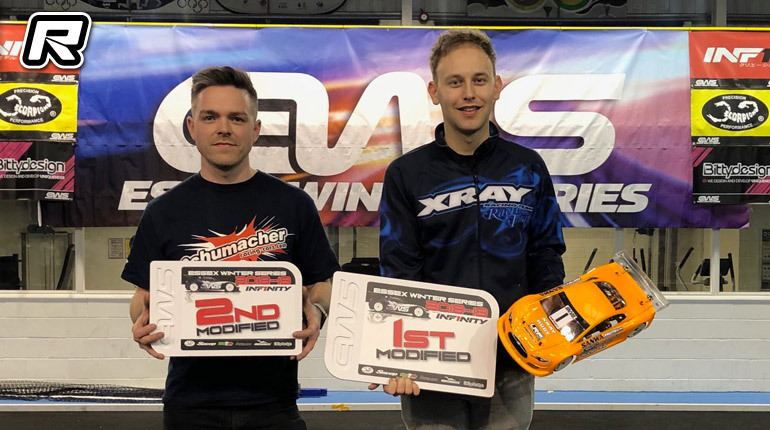 Elliott also topped Q2, as Olly moved into second ahead of Matthew, with Matt’s Associated team mate Chris Grainger into fourth ahead of Belgian youngster Florian Joos. Matthew had a chance of taking third overall in the series, with Kyle Branson absent from the finale due to his nitro racing commitments, and securing a top-three starting position would be vital for this. Elliott secured the overall pole position, his fourteenth at EWS, with the best time in the third qualifier, with Olly again second, Stefan in third, ahead of Chris and Alan. Elliott made it a clean sweep by taking the final qualifier, ahead of Olly, Chris and Matt – meaning Matthew would line up third on the grid ahead of his two Associated team mates. The qualifying result essentially confirmed Olly as the championship runner-up, but everyone wanted to end the season with a good final result. However, the A Final itself was largely uneventful for the top half of the grid, as the field circulated in qualifying order as things got underway. Elliott pulled a gap of about half a second over Olly through the opening minute, keeping Olly in contention but not close enough to make a serious challenge for the lead. Matthew held on to third, with Chris playing rear-gunner behind but also unable to get close enough to be able to challenge his team mate for the final step on the podium. Stefan ran in fifth until a mistake about half way through dropped him down the order, allowing Alan up into fifth. Out front, things remained the same which left Elliott to take his third A Final victory of the season and make it a perfect score for his three counting rounds. Matthew’s third place finish on the day left him just one point short of the overall championship podium, which Kyle held onto in his absence. Over in the Sweep Racing Super Stock class, the title was yet to be decided. Zak Finlay was the favourite, leading the points standings, and opened things up by setting the best time in the first qualifier with his Schumacher. 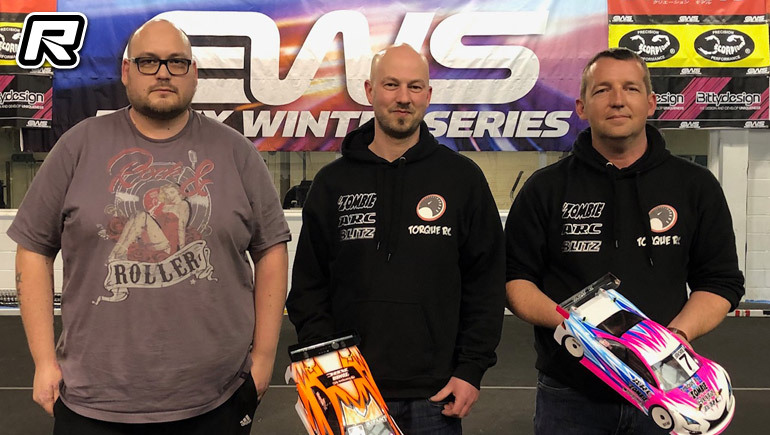 Jorg Miikael Tiit made a welcome return to the series and took second for Awesomatix, with Masters championship contender Darren Lee (ARC) in third, ahead of James Hart (Schumacher) and one of the other title challengers, Tony Broad, rounding out the top five with his privateer Xray. 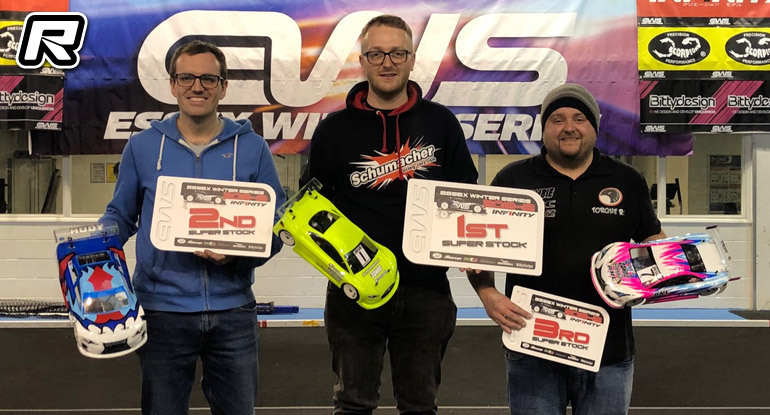 It was a similar story in Q2, with Zak again fastest, Darren taking second ahead of James and Marcus Askell (Schumacher), another of the Masters contenders. The third round also went to Zak, securing him the overall pole position, with James taking second this time ahead of Darren and Tony, with Colin Jackson rounding out the top five for ARC. The last round of qualifying saw Zak unable to make it a clean sweep, a few small bobbles pushing him down the order and allowing James to come through to take the round, with Jorg in second, then Tony, Darren and Zak rounding out the top five. 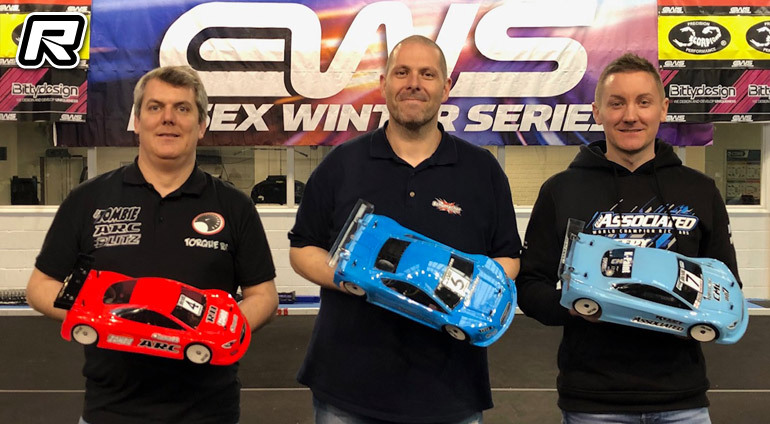 That qualifying result was enough to secure Zak the overall title, regardless of how the final would go, and also assured Tony of second overall in the series. If the A Final in Modified had been rather processional, the Super Stock race was anything but! Demonstrating just how closely matched the field was on pace, positions changed multiple times through the five minutes, with battles up and down the field. Sadly, Jorg was the first casualty of the race, moving up to second in the opening laps, but then almost immediately having a big off at the front chicane, which damaged his car and ultimately caused him to retire a few laps later. Zak was out in front and looking good for his thirteenth win at EWS to cap off the season. However, it was unlucky 13, as about three minutes into the race, and with a commanding lead, he rolled his car in the fast sweeper, and pulled the battery out of his car. 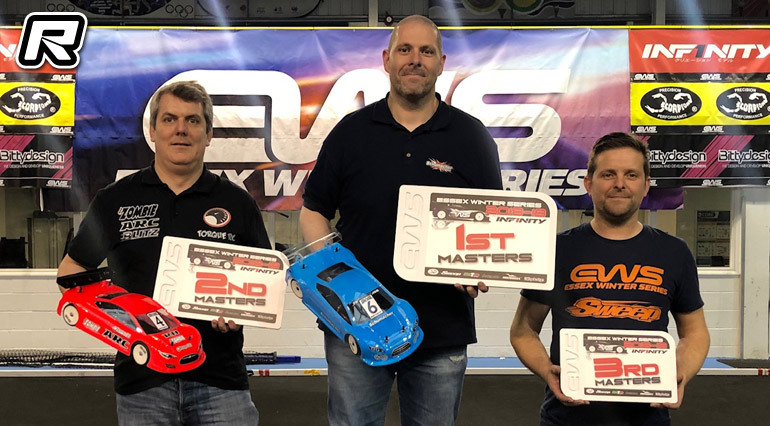 Meanwhile, the Masters guys of Darren Lee and Marcus Askell had worked their way up to second and third in the race, and following Zak’s retirement, Marcus took over the lead. Darren didn’t give up, and fought hard for the final minute of the race, but Marcus held on to take an emphatic win and his first overall victory at EWS. Darren took second overall, for his first podium at the famous Winter Championship, with Northern Ireland’s Andrew Smith, who started seventh on the grid, coming through to take third and also his first EWS podium result. 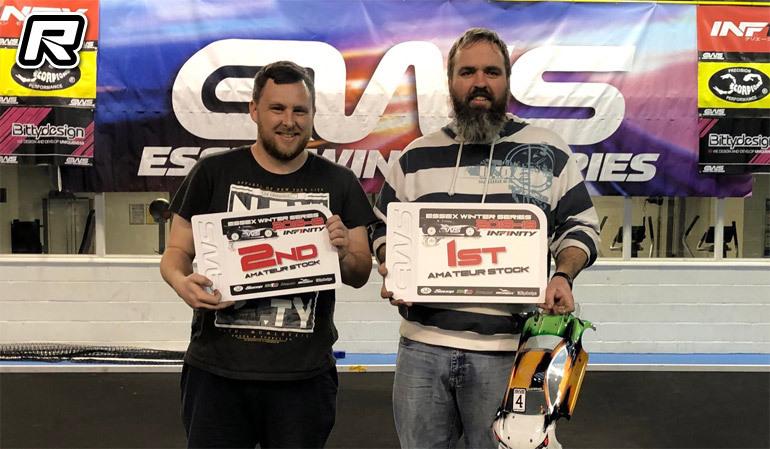 The Bittydesign Amateur Stock class had featured close racing all season long, and the finale was no different. 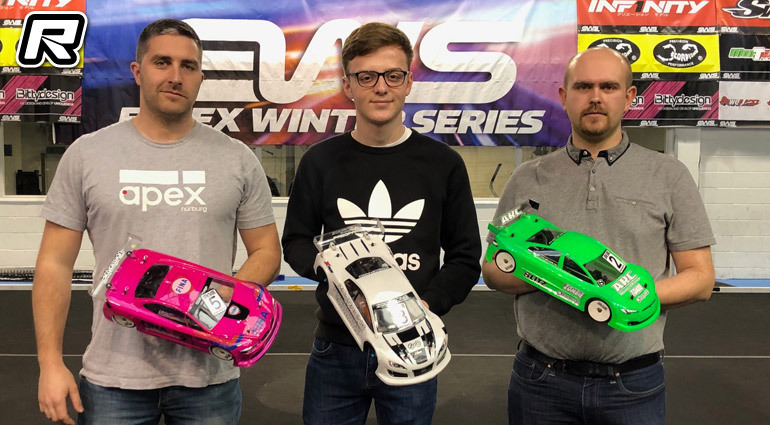 Samuel Jones took the opening qualifier from Matthew Booth and Jamie Murray, whilst Matthew took Q2 ahead of points leader Billy Kavanagh, with Jamie again in third. Round three saw Jamie set the best time, in front of Matthew and Shane Chipolina, and then secured Pole Position by taking Q4 ahead of Samuel and Matthew. Unfortunately for pole sitter Jamie, the A Final didn’t go well, as a first lap accident dropped him down and eventually saw him out of the race after just one minute, putting paid his hopes of taking the overall championship. This allowed Samuel to come through and take the A Final win, with Jonathan moving up from fifth on the grid to P2, and Matthew third. Billy Kavanagh took fourth in the race which was enough to secure him the first ever EWS Amateur Stock title, whilst Jamie’s previous points held him in second overall, with winner of the season opener Dave Lumbis third in the standings, just one point back on Jamie, Jonathan Gibbs fourth, one point back on Dave, and young Shane Chipolina just one point further back in fifth overall. Within the Super Stock class, there was the Masters category, for drivers 40 years and older at the start of the series. Marcus Askell’s A Final win today secured him the overall title, ahead of Darren Lee and Richard King. That was the order both on the day and in the Overall Championship Standings. 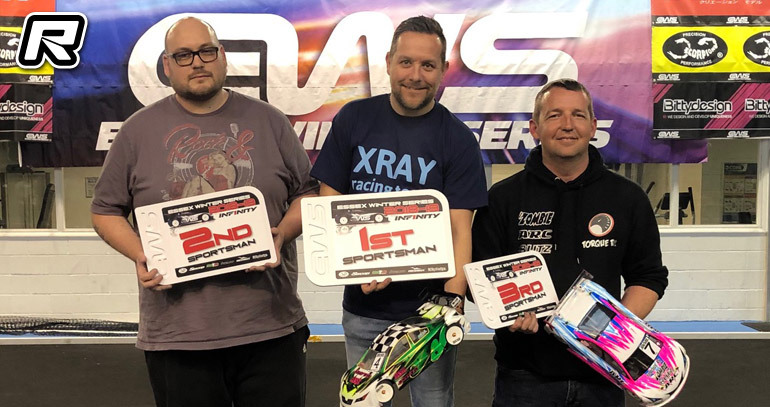 Finally, the Sportsman championship was awarded to the drivers who had not made an EWS top-30 result last year, or top results in any of the other major UK national events. Rob Brighton was the best Sportsman on the day, 6th in the C Final, but as it was his second C Final appearance of the championship, he was no longer eligible for the overall points rankings. This allowed Tristan Wilby to claim the first Sportsman title at EWS. The organisers would like to sincerely thank all the drivers, teams, and sponsors for another fantastic year of racing, which once again saw EWS as the best-attended on-road championship in the UK, with a total of 154 different drivers attending at least one event, and every event being sold out. 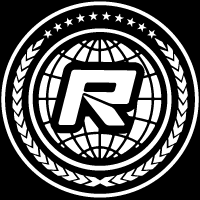 As one series ends, the planning is already underway for the 2019-2020 season, which will mark the eighth running of the famous series.